Most organizations do not even know what data is leaving their organization and when. Through our proven data protection methodology and maturity model, Securely Yours LLC has industry knowledge, technology expertise and the right team to assist you with your enterprise data protection program. 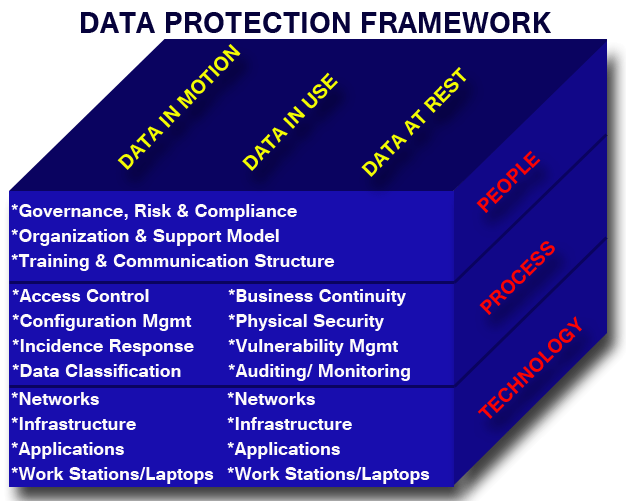 The Data Protection Framework below takes into account organization’s data in use, data in motion and data at rest and applies the appropriate people, process and technology processes to safeguard the data leakage across the organization. Remember: Data protection program in an organization is only as strong as its weakest link. Information security Assessment including industry specific assessments like HIPAA, PCI etc. Review of compliance with regulatory laws like Sarbanes-Oxley, GLB etc.